Modern farmhouse style takes into account a few cozy features — like rustic wood, burlap accents, and mason jars — to create a relaxed and perfectly lived-in space. Elements of nature can be found throughout these country homes where life moves as slow as molasses. The key to decorating a rustic-style home is to avoid landing on the edge of tacky. When designing your space, using fake flowers, kitschy signage, and the like can be just a bit too over-the-top. Begin with these timeless furniture and decor elements and you'll be right on track to a beautifully modern farmhouse. 1. Install hardwood flooring for added character. What's a farmhouse without beautiful hardwood flooring? Refinished floors with historical charm are a bonus, but if your home doesn't have original hardwood, the look can definitely be re-created with new planks as well. Check out this article for more info on how to refinish your wood flooring yourself. 2. 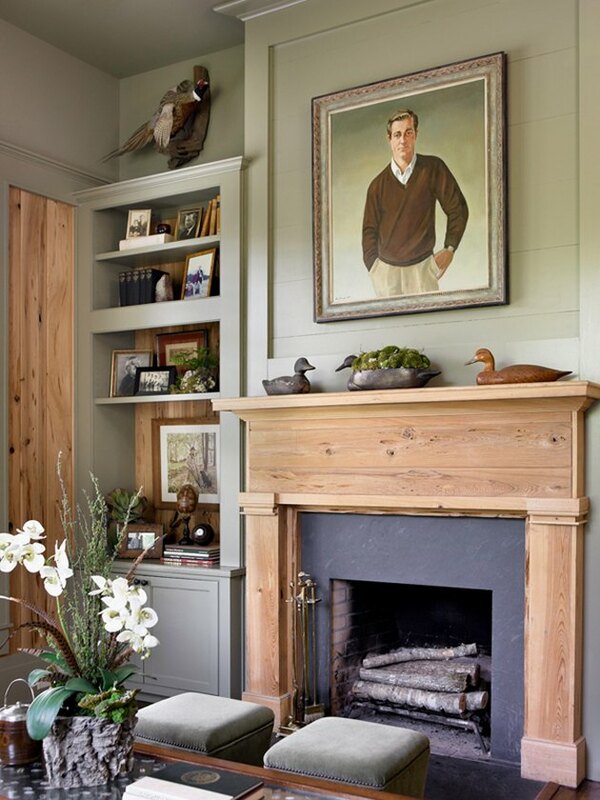 Decorate with family heirlooms and portraits. 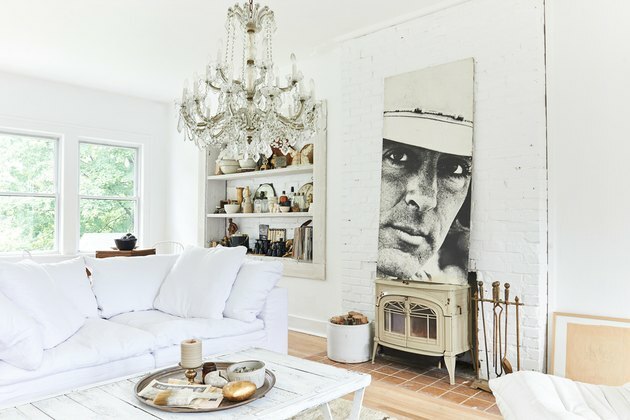 An old family portrait adds a welcome touch of history to a farmhouse-style home. Similarly, family heirlooms, such a jewelry boxes or clocks, function as meaningful and sentimental decor pieces. If you don't have family heirlooms, a quick stop to the antique store or thrift shop should do the trick. 3. 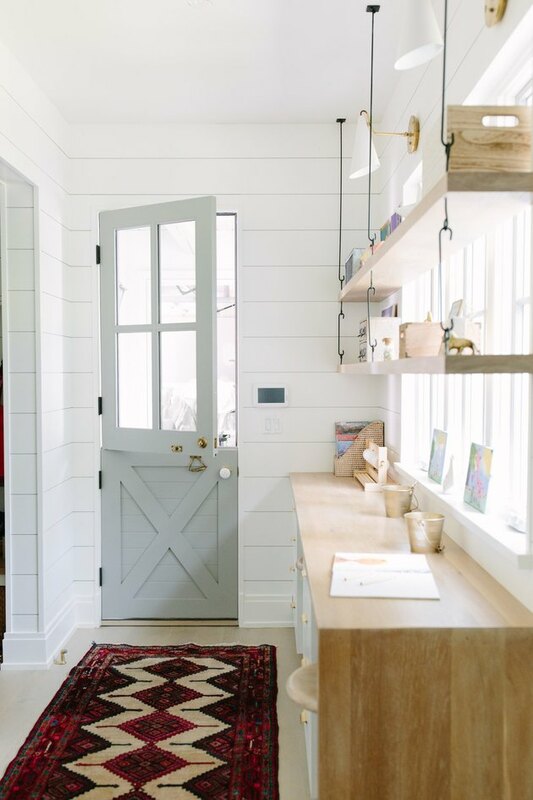 Add visual interest with shiplap. 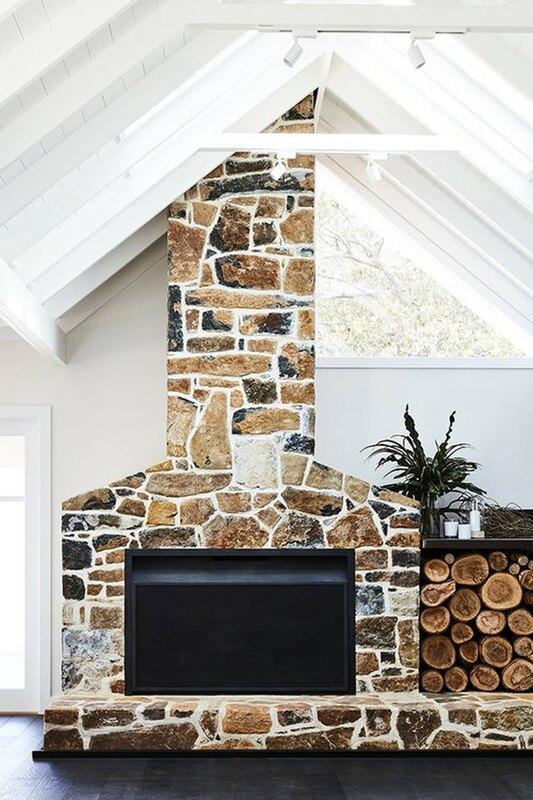 Shiplap is incredibly versatile, so go to town on your walls or ceilings — you can shiplap just about anything. If the walls in your home aren't already clad in wood planks, with a bit of elbow grease you can do it yourself. 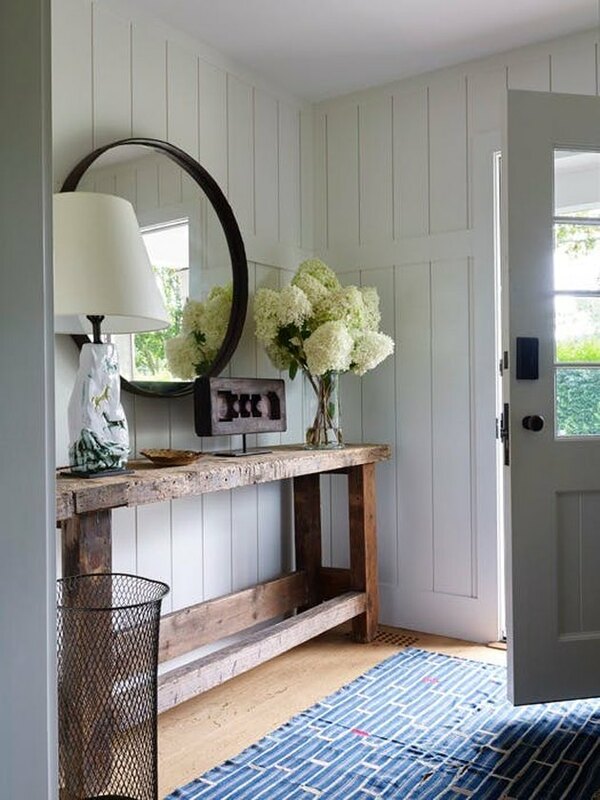 Paint it white or keep it natural — both look great as seen in this home's entryway designed by Robert Stilin. 4. Paint spaces with light and neutral colors. Modern farmhouse style homes should be bright and cozy. Shades of light gray, cream, yellow, and white are ideal. 5. 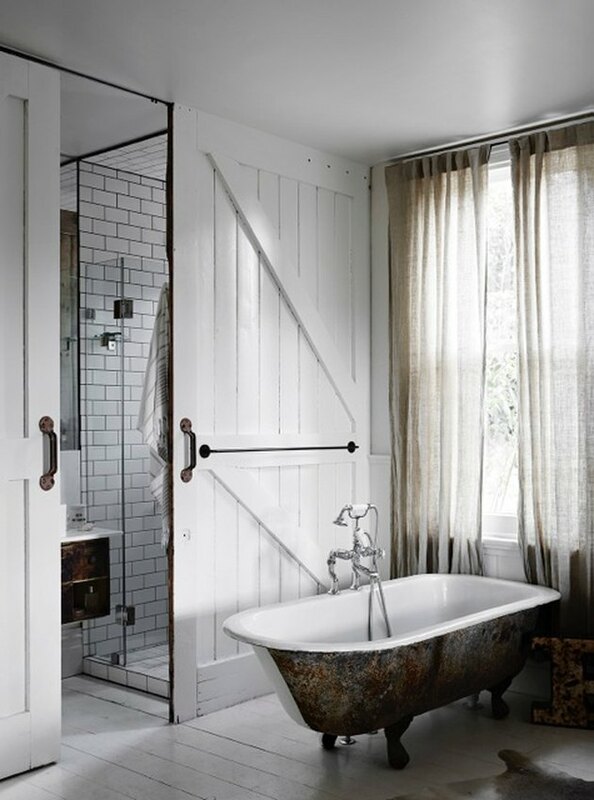 Use barn doors to make a big impact. 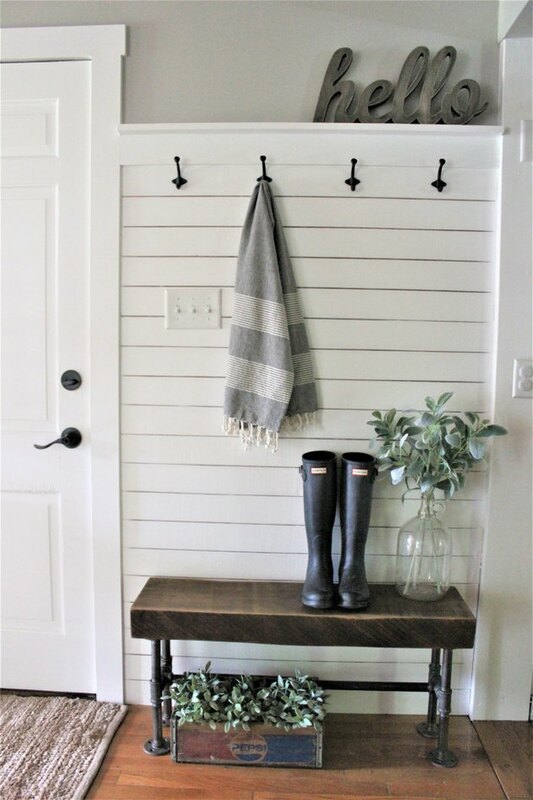 Definitely bring some doors from the barn into your modern farmhouse. They'll add so much visual interest to your space, especially if they're distressed like these doors in the Vintage House Daylesford. 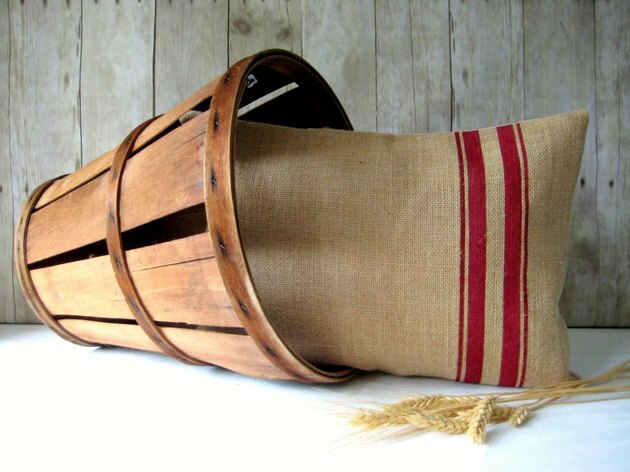 Burlap effortlessly offers a rustic vibe. However, going overboard with it can leave your home looking like it's ready for a hoe-down. Incorporate it sparingly with a throw pillow or two like this red-stripe option ( starting at $25 ). 7. Invest in furniture that's comfy-cozy. If it's not uber comfortable like interior designer Leanne Ford's living room sofa, it's not modern farmhouse style. Throw in some decorative pillows, blankets ... pretty much anything that'll make you never want to leave your sofa. 8. Install a farmhouse sink. Not to be too literal, but ... farmhouse sinks are a must. Plus, they're actually super practical. They have large basins, so you'll never have to worry about splashing water everywhere again. 9. Buy a wood dining table. Wooden tables speak to the casual, relaxed vibe of a modern farmhouse as seen in this dining room designed by Katie Hackworth. 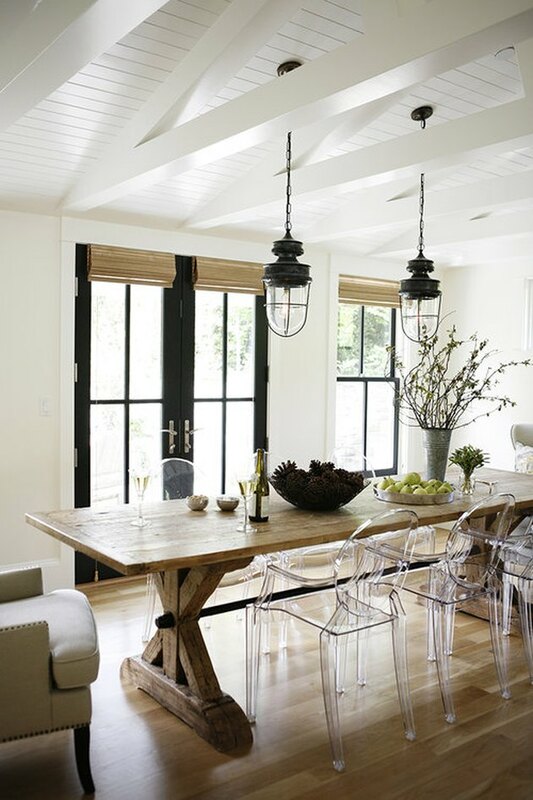 Consider mismatched dining chairs or even adding a wooden bench for a little extra flair. 10. Transform mason jars into decor. Mason jars are affordable, and they add endless amounts of character to your space. 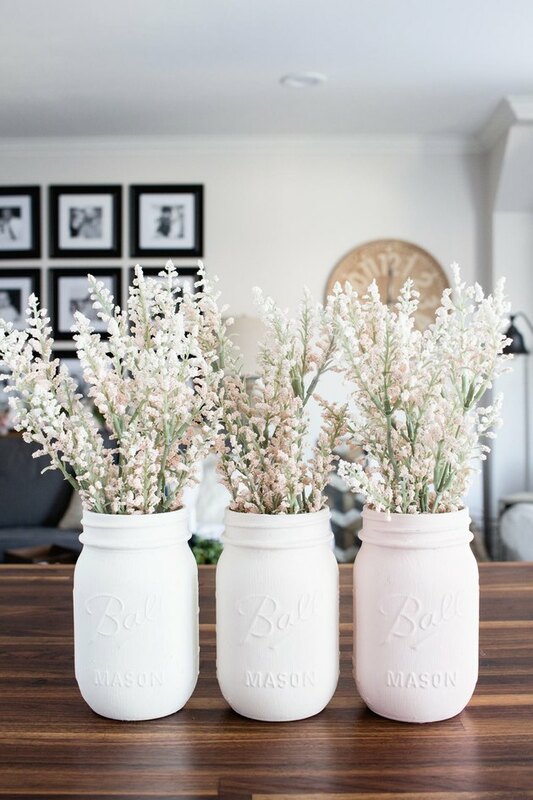 Fill them with flowers or place them on your open shelving as decor — there are tons of DIY projects featuring mason jars like this one from Shannon over at Home Made Lovely. 11. Consider a white kitchen. Don't shy away from a white kitchen. When done right, it can be fresh, clean, and simply stunning. 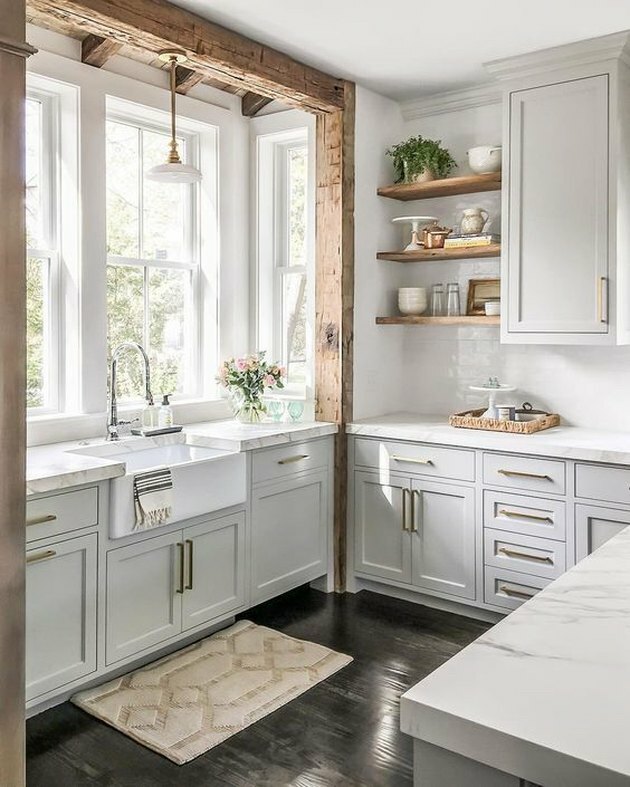 Adding in natural wood elements like the floating shelves in this kitchen designed by Sita Montgomery looks great as well. 12. Add a swing to your front porch. Sundays are just better on a porch swing, with a glass of lemonade and your four-legged best friend beside you. Invest in one like this lakeside beauty designed by Chango & Co. that adds curb appeal and is super comfy, too. 13. Display your treasures on open shelving. Open shelving is the perfect place to display farm-inspired decor and family heirlooms. 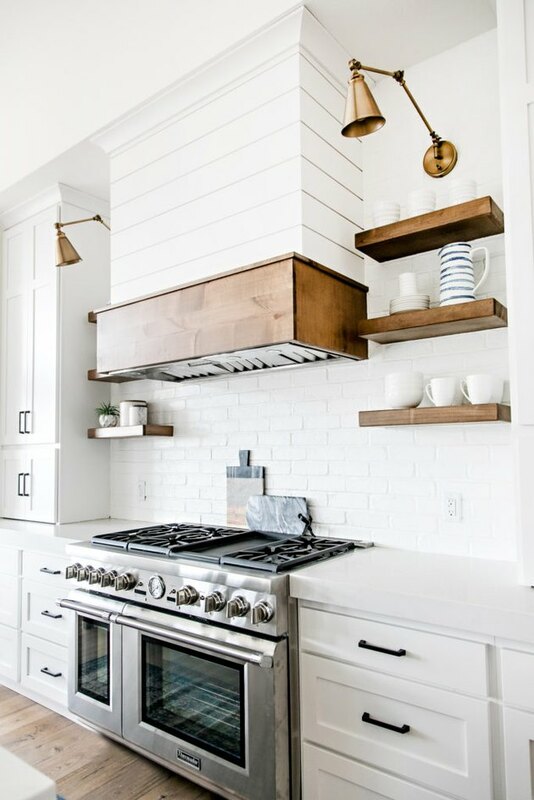 Go for a simple white or rustic feel with your shelving. 14. 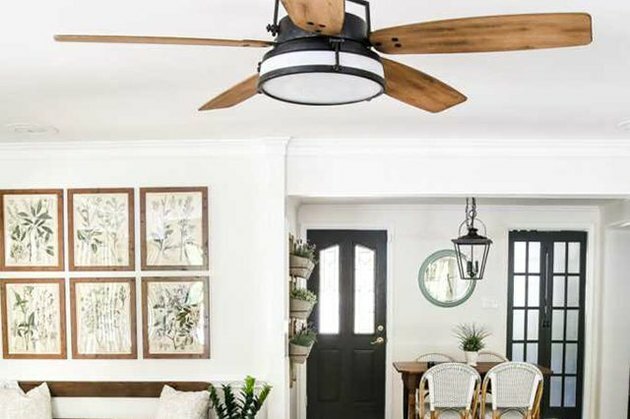 Choose a farmhouse-style ceiling fan. 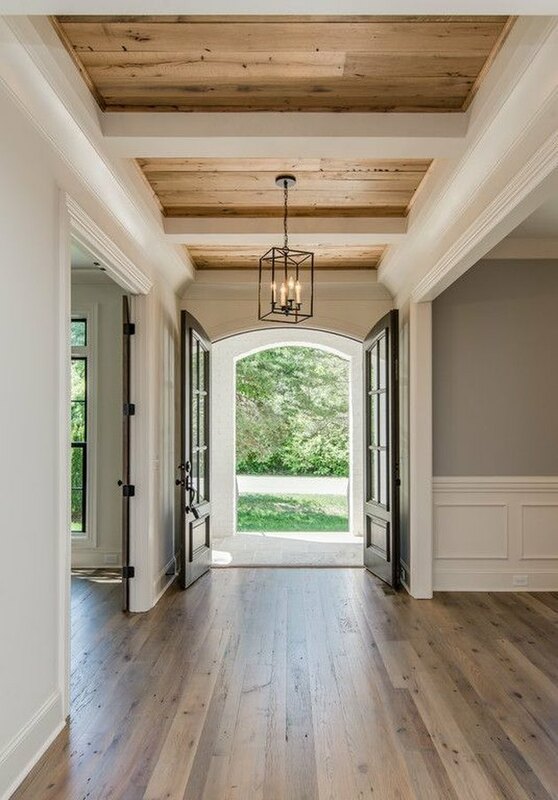 Ceiling fans can be fantastic additions to farmhouse-style homes. Not only do these modern pieces of decor help keep you cool on a hot summer day, but they also add a rustic layer to your ceiling like this one in Lauren from the Bless'er House's living room.